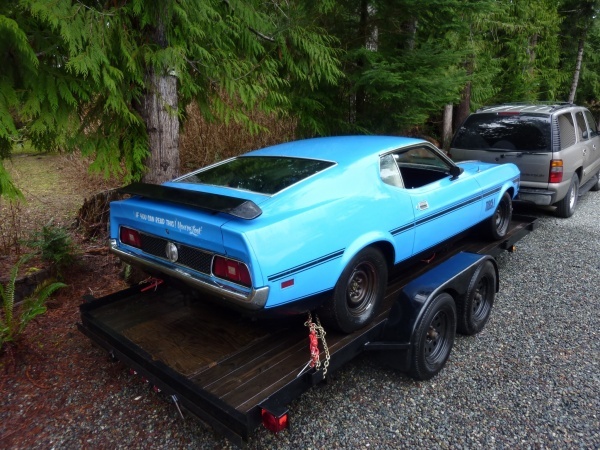 When reader Mat S saw an ad for a 1971 Mach 1 Mustang on Craigslist, which the seller claimed had had a 429 Cobra Jet in it, he knew he needed to take a look at it. He didn’t know much about these cars, so he spent a day researching and learning about them. When it finally came time to go take a look at it, he was hoping it would be a real J-Code 429 car. After a quick glance at the VIN, he saw what he was hoping to see, the J-Code. He quickly bought it, loaded it up on his trailer, and took it home. As soon as he got home he sent out for the Marti Report, which he received the next morning. While he was waiting for it to arrive, he started investigating the car closer. He already knew the original 429 had been replaced with a 351, but he also noticed that the brake pedal was rather small and that the automatic transmission would shift without the key in it. With these discoveries, he knew the car had originally come with a manual. When he finally received the Marti Report, he discovered it had come with a close ratio four speed manual, 3.50 Traction-Loc rear axle, and the 370 hp Ram Air 429 Cobra Jet. 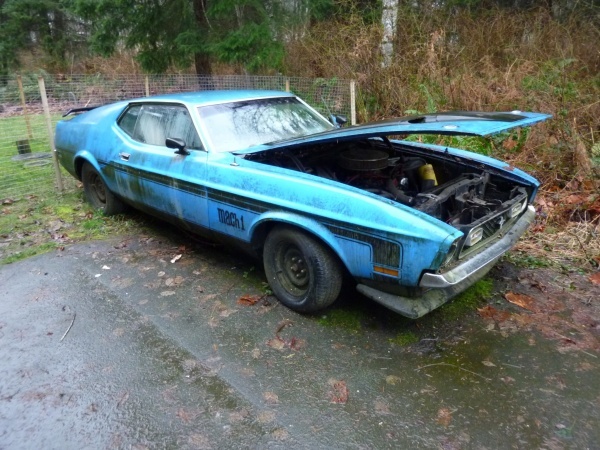 Mat has already set about cleaning his Mach 1 up, but it is in need of a full restoration. There are a lot of pieces that are either missing or will need replacing. He hopes that his two sons will be able to help him with the project as they get older. In the meantime, he is hunting for a correct 429 Cobra Jet and a close ratio four speed for it, which could be a difficult task. 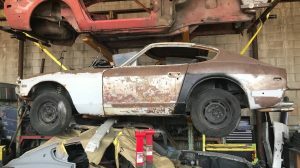 After contacting a friend, who has a ’73 Mustang, Mat discovered it’s a small world we live in. His friend happened to know this Mustang back when the previous owner’s Uncle still owned it. He even has photos and videos of it back in the ’80s. 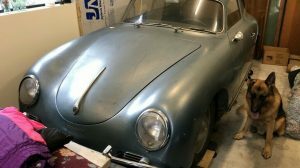 This looks to be a great starting point for a project and we are sure Mat and his family will enjoy working on it and driving it once it’s completed. Special thanks to Mat and his family for sharing their find with us and we wish them the best with it! What a great find! 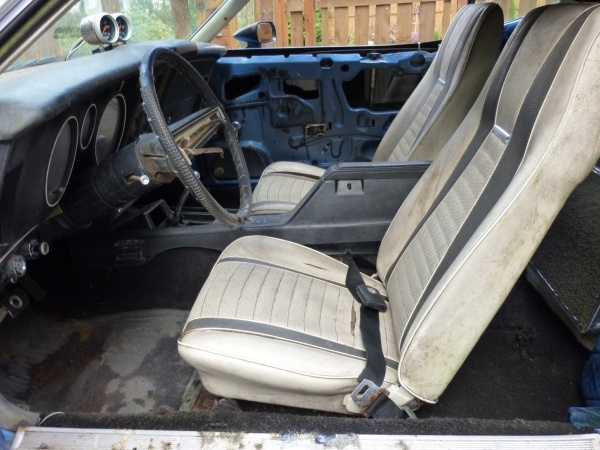 VERY jealous…..can’t wait to see how this restoration turns out! Very cool, that’s a LOT of car for someone who doesn’t know these very well. You’ll enjoy it, good luck with the resto! Well done sir. 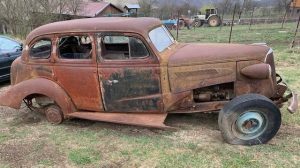 Nice find and I am sure you will enjoy the restoration of it. Keep us updated. Well done, great find, it won’t be matching #’s but with careful hunting he should find period correct stuff, next best thing. Good luck to him, great story. Wow. That’s a good day when you stumble upon one of those. Job well done to the buyer. 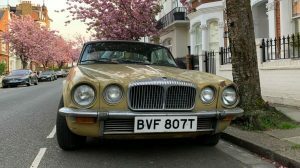 I always wonder how people can allow these car’s to deteriorate to this condition, they use the excuse We’uns wazza gonna fix er up sum day. This would definitely be a labor of love. Some might argue that it would be a project to avoid but I’ve seen many projects that seemed a lot more futile than this. And they turned out great. Finding an engine is going to be a challenge though. I think if it was mine I’d tend to use a reasonable facsimile for an engine, like a standard 429 or 460. At least that could get you going until you could come up with the CJ, and the cash to bring it home. All the best in the restoration of your great find, Mat. I’m hoping you get a few pleasant surprises along the way about things that might need less work than you expected, bringing you closer to that first drive. I can’t believe the ’74 Chevy above this has garnered so much more attention than this incredibly rare exciting beauty. Best of luck with it, I’m jealous! Fantastic find. I have always had a soft spot for the larger then life era Mustangs. This is super cool. Good luck to the buyer. Being a Mustanger for decades it is rare to come across these. May I suggest to keep an eye on the budget. In the end, there is only so much you can sell it for. Can you use “for” at the end of sentence? I may have the correct engine from this car. I will provide the VIN upon request. Who knows, we´ve seen funnier things happen. Thanks for all the comments, this is my car. A friend of mine found a correct D0VE-A Cobra Jet short block, I bought it a few days ago. Ford stamped the first two and last six digits of the VIN on the left rear of the block just below the deck surface. 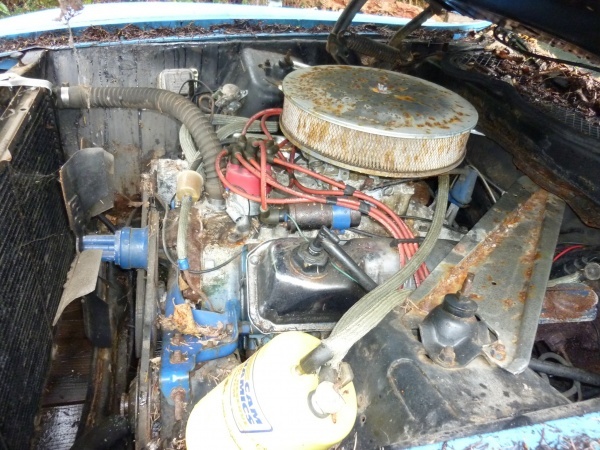 CJET, the original engine for this car would have VIN 1F155336. Tim, we are in British Columbia, Canada and it appears we should be able to find most of the missing parts here locally, thanks anyway. IF this car is VIN 1F181198, we need to talk.